Yesterday I sat in a cosy armchair. 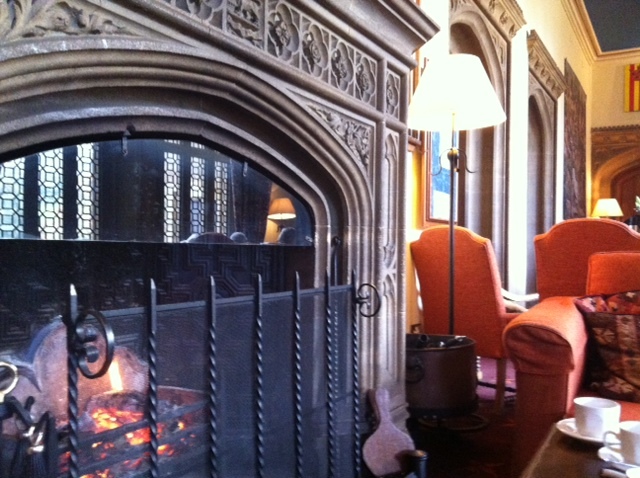 It was by the fireplace at Dillington House, a sixteenth century stately home and education centre near Ilminster, where the sleepy beauty of the sandstone exterior contrasts happily with the intellectual pursuits inside. It’s also the place where I first met my husband, so it’s fair to say it’s a building that’s played an important role in my life. My tutor yesterday was Elizabeth Rapp, a poet and Middle English scholar leading us through the twisting, turning story of Sir Gawain and the Green Knight. It’s a tale I had brushed lightly against a few years before – I remember listening to the Radio 4 adaptation of the then just-released Simon Armitage translation – but spending a day immersing myself in its rich imagery was absolutely fascinating. Elizabeth gently guided us through the medieval landscape, taking detours via Keats, Langland and C.S. Lewis. For just this one day, we held true to Coleridge’s ‘willing suspension of disbelief, which constitutes poetic faith’ and left our prosaic world to enter a supernatural place of headless knights, enchanted girdles and dark arts. It was the sense of contrasts in the poem that captured me the most. Firstly, the flamboyance of the Christmas feast at Arthur’s court with its courteousness and merriment, jewelled silk tapestries and ‘flavoursome delicacies of flesh’, being interrupted by the arrival of the Green Knight and his ‘weird war-horse’. 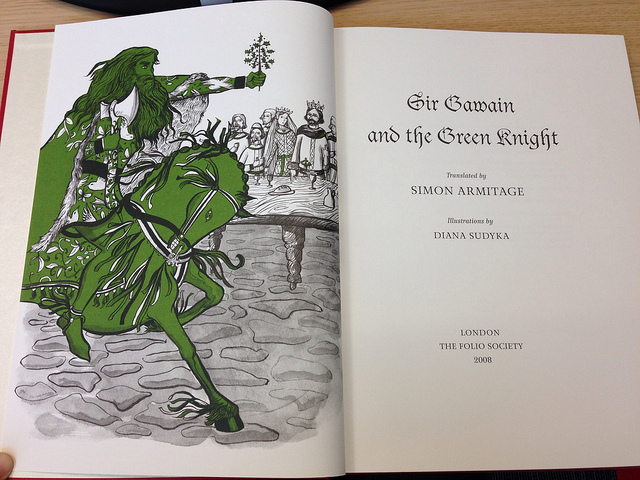 The Green Knight, to the common folk of the middle ages, would have been the encapsulation of the beauty and cruelty of nature – ‘a mountain of a man’ yet finely dressed in clothes embroidered with butterflies and birds, who is by turns brutal then gentle as nature can be unyielding then generous. His challenge – behead me now, then in a year and a day, find me and I will behead you – reminds that man is at the mercy of nature for food and survival and we are only ever a few seasons away from being ruined if we don’t follow its rules. When the Green Knight leaves Camelot carrying his own dripping head in his hand, the knights continue their feast, carousing into the New Year. Then the next cycle of contrast begins – Gawain’s lonely journey through England’s realm and ‘bleak terrain’ to find the Green Knight. This man in exquisite armour and finery fighting his way up steep slopes, ‘bivouacked in the blackness amongst bare rocks’. His arrival at Bertilak’s opulent castle, then the hunt of the wild boar, so grisly and unmerciful. The softness and ‘glorious’ beauty of the lady of the castle contrasting with her attempts to seduce him. Gawain’s repeated displays of fidelity by rejecting her approaches, then his capitulation to wear her enchanted girdle to try and save his own life. The eventual facing of the Green Knight, whose brutality is finally revealed to be a test of the purity of Gawain’s heart. “Such strangeness should occur at Christmas”, says Arthur after the Green Knight’s arrival, and I thought yes – this is precisely when we welcome our contrasts the most. As we sit safe and warm in our castle – or our Somerset stately home, sipping hot chocolate by the fireplace – this is exactly when we want to be reminded of the wildness of the world outside . Like M.R. James inviting his young scholars to sit in his warm rooms, safe in the candlelit company of others while James shares stories of solitary young men imperilled by dark forces. This contrast gives us comfort, adds a sense of unreality to the things we discuss – we experience, as Mark Gatiss says, the safe thrill of having your flesh creep.